13th September 1520, Bourne, Lincolnshire, England. William Cecil (Lord Burghley) was the son of a father (Richard Cecil or Cyssel) and grandfather who had acquired wealth and office and the status of gentry by service to the Tudor Monarchs and marriage to local heiresses. Mother was Jane Heckington. 1535: Cecil went to Cambridge. 1540: His father tried to prevent what he regarded as an improvident marriage to Mary Cheke and Cecil was removed from the University and admitted to Grays Inn in London to study law. However the marriage took place the next year, probably in secret, at Cambridge. 1541: Birth of his son Thomas. 1544: Death of his wife, Mary on the 22nd February. 1547: He was appointed Master of Requests by Edward Seymour, Duke of Somerset, who was uncle of King Edward the Sixth. Cecil became the private secretary and advisor to the Duke who was Protector of the Realm during the minority of the King. (10th September) He was present at the Battle of Pinkie against the Scots and it was claimed that Cecil narrowly escaped with life. 1549: On 13 October William Cecil was sent to the Tower of London with Somerset but was released on a bail of a thousand marks. 1550: He acquired the Manor of Wimbledon, and he bought a house at Canon Row, Westminster. 1551: He was knighted in October. After the fall of Somerset, Cecil was made a member of the Privy Council but unhappy about signing the instrument which sought to disinherit Princesses Mary and Elizabeth. 1552: William Cecil appointed Chancellor of the Order of the Garter in April. 1553: Death of his father on 19th March. King Edward VI died in July and Cecil was forced out of office. The Burghley estate was settled on his mother for life, but he was left estates in Rutland, Lincoln, and Northamptonshire. 1556: Birth of his daughter Anne. 1557: Death of his mother on 10th March. His mother’s family had owned the estate at Burley which now made the Cecil family wealthy landowners. 1558: During the reign of Queen Mary he conformed strictly to the Law, however at her death on 17th Nov he was one of the earliest visitors to Princess Elizabeth whom he had secretly kept in touch with for years. Cecil was the first of the new Privy Council to take the oath and was made Secretary of State. 1559: Birth of his son William who died in infancy. 1560: William Cecil was elected Chancellor of the University of Cambridge in February. 1561: In January Cecil was granted the office of Master of the Court of Royal Wards and he began a much overdue reform of the Court. Birth of his third son, also called William who again died in infancy. 1562: The estate of Theobalds in Hertfordshire was purchased and became Cecil’s principal seat. 1563: Birth of his only surviving son Robert at Westminster. Cecil’s has been frequently charged with preventing the promotion of his nephew Francis Bacon. There appears to be little doubt that this was true as he was ambitious for his clever son Robert, and not inclined to encourage a talented rival. Although chosen as Speaker of the House of Commons his other duties at Court made acceptance of the post impossible. 1571: On 25 February he was raised to the Peerage under the title of Lord Burghley. Queen Elizabeth was very sparing in her new creations and in the year of her accession only three new peerages were created, and during her reign there were only fifteen new creations. 1572: The elderly Marquis of Winchester died in March and Burghley became Lord High Treasurer. 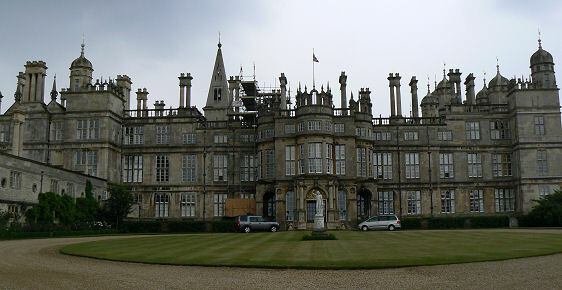 1577: Grand extensions built to Burghley House. 1586: Cecil was chiefly responsible for the execution of Mary Queen of Scots, after the discovery of the plot by Thomas Babington to assassinate Queen Elizabeth. Other members of the Privy Council appear to have put the responsibility firmly upon the Lord Treasurer. Davison, the Queen’s Secretary who had affixed the seal to the warrant for the execution of Mary Queen of Scots, was sent to the Tower, though it is said that that he only acted under duress from Burghley and Leicester. Burghley soon recovered his position with the Queen. His son Robert was appointed temporary secretary to the Queen, a post which lasted through into the reign of King James the First! Edmund Spenser is said to have satirised the two Cecils, father and son, as the fox and the ape in “Mother Hubberd’s Tale”. 1587: More extensions at Burghley House. 1590: Burghley became deaf, but continued to be active in the Queen’s affairs until 1595. 1594: The Earl of Essex and Francis Bacon had their own intelligence service which was responsible for the conviction and execution of Dr. Lopez, the Queen’s physician, for High Treason on a charge of attempting to poison her, although the Cecils and the Queen believed in his innocence. He was executed at Tyburn on the 7th June. 1. 1541 to Mary Cheke, sister of his Classics tutor. (died 1544). 2. 21st March 1545 to Mildred Cooke, daughter of Sir Anthony Cooke of Gidea Hall, Essex. St. Martin’s Church, Stamford, Lincolnshire. Home, Burghley House, near Stamford.